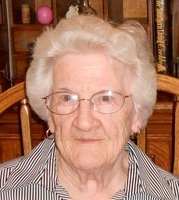 Provide comfort for the family of Gertrude Bazinet with a meaningful gesture of sympathy. Gertrude Elizabeth (Strange) Bazinet, 95 of North Adams, MA died on Sunday, March 10, 2019 at her home. She was born in Grafton, NY on February 12, 1924 a daughter of Earl and Elizabeth (Viguers) Strange. She attended North Adams Schools, and graduated from Drury High School. Gertrude was last employed by the Cornish Wire Company, where she worked for 27 years until her retirement. She was a member of the First United Methodist Church in North Adams. Gertrude enjoyed Bingo and crossword puzzles. Gertrude was the widow of Louis Edmond Bazinet, whom she married in 1963. He died on December 18, 1992. Survivors include her daughters Elizabeth Rancourt of Williamstown, MA; and Cynthia Clermont Rebello of North Adams, MA; son Daniel E. Clermont of Melbourne, FL; eight grandchildren; several great grandchildren and great-great grandchildren; as well as nieces and nephews. She was predeceased by her daughters Dianne Wiles Tetrault, and Barbara Doan, as well as nine brothers and sisters. FUNERAL NOTICE: At her request, there will be no services. Burial will be in Bellevue cemetery in Adams. To add to the Book of Memories, please visit www.flynndagnolifuneralhomes.com. To send flowers in memory of Gertrude Elizabeth Bazinet (Strange), please visit our Heartfelt Sympathies Store. Provide comfort for the family of Gertrude Elizabeth Bazinet (Strange) by sending flowers. Just found the notice of Aunt Gert’s passing. I’m so sorry to see that last of her generation is gone. My love and condolences to her remaining family members.